Most of the time, we tend to look at ourselves and see how small and weak we are, just like Gideon, when he heard God’s calling in Judges 6:15. 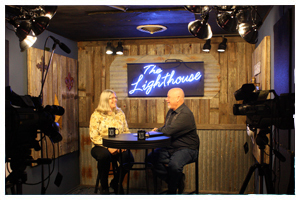 No one would have imagined God would bring ERS and The Lighthouse Church together to build a TV studio, producing weekly programs that would impact up to 101 cities in Northern California and the San Francisco Bay Area with the gospel of Christ. This is a testimony of how weak vessels, when working together in unity, can accomplish “the impossible” with God. Early 2007, ERS had just completed Fly Away from Superstition DVD, to save the office rental expense in order to propose the next Gambling Addiction DVD- Quick Fix, ERS moved the office back to Charles Lin’s house. When the time came to have a new office space for Quick Fix, we prayed that God would provide an office for us. During the same time, Lighthouse Santa Rosa, a 70 member local church, decided to take a leap of faith and expand their sancutary, despite limited resources. From the start, ERS set out to walk in obedience. Since 2003, In response to what Jesus said in Luke 6:38, “Give, and it will be given to you,” ERS has given away over 23,000 testimony DVDs to ministries and missionaries in Asia, America, and several European countries. In 2007, after learning that ERS was looking for an office space, the Lighthouse leadership saw the need and offered a 250 sq ft trailer as office space to ERS, free of rent. To our amazement, two weeks after they gave ERS the office space, The Lighthouse received a donation of a 1,000 sq ft trailer from the contractor of the original Lighthouse trailers! This was only the first of many more surprises. Soon after that, a group of Fijian-Americans approached pastor Kelly and inquired about starting a Sunday afternoon service. The Lighthouse saw this as opportunity for “kingdom expansion,” and agreed. Before long, 3 other Fijian groups came, and The Lighthouse began to get connected with many Fijian brothers and sisters in Christ! ​Rampart realized”- A story of how a faithful pastor’s wife, a phase two Hodgkin’s lymphoma patient, clung to God’s promises and was completely healed. After eight years of marriage with no children, an infertile couple is blessed with three children, and experience supernatual healing of their baby’s club-feet. ERS believed that God is redeeming media and will use it to fill the earth with the knowledge of His glory. Pastor Kelly shares this same vision. Thus, he has supported and participated in the works of ERS and Vision Mundial. Recently, he decided to sign a contract with KTLN, a Christian TV station, providing weekely 30-minute gospel programs. “Build a TV studio and produce weekly programs for an entire year?” This sounded like “mission impossible.” Neither ERS nor Lighthouse has the abilities to do this by themselves. However, united in Christ, we can dream big. Together, ERS and the Lighthouse decided to say “yes” to God. Pastors Kelly and Roy began remodeling the trailer, and ERS began designing the hardware and software needed for the studio. Almost an entire month was spent gathering recycled building materials, shopping on ebay, making trips to HomeDepot, and finding innovative ways of utilizing old equipment, including converting an old fan switch into a light controller and using a retired laptop for digital countdown. After repeated modification, repairs, and testing, the TV studio was officially established. In the end, mission impossible became a miracle come true. Obedience was not always easy. As with every step of faith, there is always risk and inconvenience involved. But in the end, it was all worth the risk God took small beginnings and expanded them.